Well, it's been nearly two weeks since the race so probably about time that I put together a race report. First of all, this was probably the funnest race that I have ever participated in. It was well-organized and scenic and a pleasure (er, relatively) to run. Holli, as always, was the best crew that I could ask for and deserves my utmost thanks and appreciation. I'd also like to thank my parents for coming out to support me and for my brother Dave and sister-in-law Lauren for coming out to help pace. I'd like to thank Dirty Girl for some much needed cups of soup and espresso beans at the covered bridge station, Kevin for his help as I cruised in and out of aid stations, and Mae and Nate for their enthusiastic support. Finally, I'd like to congratulate Dirt Dawg, who has finally chased down his first 100 miler and thank him for his support and company during those first miles. In truth, there are many others who also deserve thanks. There are Tom and David who I had not met until the covered bridge station, but who both volunteered to pace me through much of the night. David, good luck finishing the Grand Slam--that is an incredible accomplishment. There are the podiatry students who did their best to keep my feet from falling apart at various aid stations. There are the aid station volunteers and fellow runners who magically showed up with mole skin, duct tape, and a variety of other medical supplies when the podiatry students weren't around. Then, of course, there are all the volunteers who just made the whole event happy. I've decided not to write much about the details of the race itself. Let me say that the first 50 miles went pretty well (11 hours) and I was even feeling pretty good after 60. Then a couple blisters began to form. Then, I made the mistake of removing some moleskin that I thought was bunching up on me (it was, but it was also providing some critical padding). Then it began to rain. Then I had to run through some pretty significant mud. I finished in just over 28 hours and 30 minutes, but my final pace was a pretty pathetic hobble and my over-riding memory of the last third of the race was largely one of, let us say, discomfort. It was frustrating as my leg muscles held up well and it was really my feet that caused me such significant problems. As you can see from the photo of Holli and I crossing the finish line, she is quite literally pulling me along. Still, I didn't give up and I am proud of that accomplishment. Furthermore, I think the foot problem is something that can be managed. In fact, two days after the race I realized that my toes were so cramped up that during I was not actually moving most of the muscles in my foot. I'm not sure if this was caused by the change in my gait due to the rather large blisters on my feet or the other way around. In either case, it gives me an excuse to buy some new socks and shoes and, perhaps in the near future, to try out some barefoot running to strengthen my foot muscles. All that aside, here was my epiphany as I cruised through the ups and downs of the race. What if, rather than thinking of all this running as a series of training cycles and races I just ran when I felt like it. I mean, why does something as fun as running 100 miles need to be a once a year event? In fact, it has taken me a couple 100 mile races to realize that I do, in fact, really like to run. Perhaps for people who are training intensely for particular times or to win competitions, the distinction between training runs and actual races matters, but I have typically run races at nearly the same pace that I train. So what is the point of distinguishing between training and racing? This matters because, despite the foot issues, Burning River was just fun and I would like to do it again. So, I've decided to go ahead and sign up for the Hallucination 100, which is Michigan's first 100 mile race. You are all welcome to join me as spectators, crew, or pacers. The run is a series of 12.5 mile loops and there is a campground on the loop where everyone can hang out all weekend. What else can you ask for in a good time? Click on the link "Urge Your Senators to Cosponsor S. 1630, the Affordable Access to Prescription Medications Act," enter your zip code in the box called “Call Now” and click on the “go” button. You’ll then be presented with the contact information for your senators, as well as get talking points for what to say when you call. Please ask your family, friends and coworkers to call on your behalf as well. I almost forgot. If you would like to see how I am doing on race day, check out the BR live webcast. I'm bib #68. I am a bit ashamed to admit that I have spent quite a bit of time in the past few days reflecting on why I like running 100 mile ultramarathons. I really have wanted this to be a good post on the eve of Burning River as, after nearly 200 blog posts and raising nearly $12,000, I've decided to take a break from fundraising. While it has been an integral part of my ultrarunning and it is both an important and personal cause, I have only barely had sufficient time to keep the group operating as it warrants. At the same time, I'm still receiving emails and comments from interested runners and getting an average of two-dozen hits per day so I've been hesitant to just let the group disappear and the hard work that we have together put into this fade away. That is why I am happy to announce that Cruz Pitre has agreed to take over management of the Lupus Runners website to keep the movement going and growing. 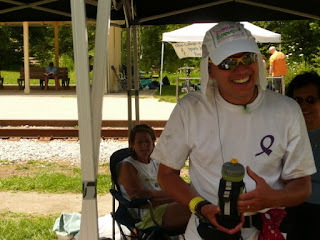 We need to talk about the details still, but some time after Burning River I will redirect the www.lupusrunner.org to a new site. Cruz is adamant runner and been a dedicated member of Lupus Runners this year and I know that he will do a great job as I take a break to focus on other things. You will, of course, still be able to see what I am up to at my various other websites such as www.brianthesociologist.com and, now that I finally have my hands on a Blackberry, I'm increasingly addicted to Twitter so look for me at www.twitter.com/thomasb7. Also, rest assured, that I will keep running. Which takes me back to the point of this post--why run 100 miles? Since I haven't been able to come up with an eloquent and thoughtful diatribe, I'm resorting to a bulleted list. Here goes. A central precept of Buddhism is that life is suffering and the key to happiness is letting that go. Running 100 miles involves suffering, then letting that go, the suffering some more, then letting that go, then you finish. You get to know people really well when you run with them for 12 hours. You get a cool belt-buckle at the end. You get to know yourself really well when you run for 24+ hours. No one ever asks you your time afterward, they just ask "At one time?" Did I mention how good certain food tastes after 50 miles? After my first 50k, I almost cried because I was so glad that I actually did it. After my first 50 miles, I felt a deep sense of satisfaction. After my first, and only so far, 100 miler I was so tired I didn't particularly feel anything other than some mild confusion that I did not need to keep running. In fact, rather oddly, after 50 miles I was glad to be done. After 100 miles I was somewhat disappointed that it was over. Thanks to all you Lupus Runners out there who have helped get us this far. Also, many thanks to everyone who has made donations--we have collectively raised nearly $12,000 since 2007. I look forward to finally meeting some of you in person at Burning River this weekend. In the meantime, check out this recent article in the Dayton Daily News. Well, ready or not the Burning River 100 is just around the corner. I confess that I am less certain about my preparation this year than last year. Ironically, being in China was not a great problem in terms of my training. However, getting my schedule cleared to go to China and catching up on time with my family and work stuff left me with fewer miles on the road then I would have preferred. Still, I had a few 30+ mile runs, a 40 mile run, my 12 hour Great Wall adventure, and a recent 32/25 back to back run, so I think I still have a good shot at finishing as long as I run smart. My plan is to start out more slowly than I did at Haliburton and to try and keep a more even pace throughout. Last long run, I used a 10 minute run/5 minute walk pace that allowed me to complete 25 miles in 5 hours, even after doing 32 miles the day before. I ran even splits throughout and felt pretty comfortable at the end so I think this is a better strategy than the 9/1 and 25/5 run/walk ratios that I used at the beginning of Haliburton. The logistics of Burning River are also slightly more complicated than at Haliburton since it is point to point as opposed to two out-and-backs. However, my parents are going to be joining Holli as part of my crew so we will have additional support. We're also going to try and coordinate crew needs that we didn't really plan well for at Haliburton--namely the need for Holli to sleep and eat at some point during the race. There is supposed to be cell phone service throughout so that should help too. Perhaps I'll twitter the event. In terms of equipment, I'm planning on using a single water bottle throughout and, depending on the heat and my pace, an additional water bottle in a holster. I was pretty happy with how that worked last time. I'll aim to consume 100 calories of gel, honey, or sport beans every 30 minutes and to take electrolyte tablets every 20-30 minutes. I'll start eating some solid foods at 10 hours or so (soup probably). I'm going to try and stick with Dirt Dawg as he heads for what I am sure will be his first 100 mile success story. I'm also looking forward to meeting Nate and Mae, two of our Lupus Runners from last year, who will also be at the event. It should be a good time! I confess with some guilt that I haven't really had the time or energy to do a great deal of fundraising. I do want to thank everyone who has donated so far and to ask those who haven't donated to consider making a contribution to this important cause. I think 2009 might be my last harrah in terms of fundraising (at least for a little while) as I've had difficulty pulling together the time and energy that I feel the cause really warrants. It might be better for me to take a bit of a break (at least from fundraising--running keeps me sane so I don't expect to stop that!). So this is the last time I'm going to ask all of you for money, at least for the next year or two. Help me out this one last time and click the donate button on the right! I'm far from an elite runner and not even particularly fast, but I have been around the block. I've completed a 100 miler, a 50 miler, and a few 50k races. I can generally go 50 miles in under 10 hours and 50k in under 6 hours. 22 minutes per miles isn't even a fast walk--at least under normal conditions. These were certainly not normal conditions. I compared my times with a local guide and it sounds like I was moving on the wall about twice as fast as most people. I tried to run the flats (which were very few) and walk the stairs. While I did stop to take breaks and take photos, I tried to minimize these stops, which I think it part of why I covered the ground so quickly (at least relatively). There were some mildly treacherous areas where running was simply not an option, at least if you are concerned about falling off the wall. Still, I kept moving and, as some past ultrarunner once quoted, I blew past rocks and trees like they were standing still. Perhaps my times speak for themselves, but I would definitely rate this as a 10/10 in terms of difficulty. I believe most of the marathons that are held on the Great Wall are only actually on the Wall itself for 3 to 6 miles. I will note, with no small amount of pride, that I was on or alongside the wall for about 20 miles. Seriously, it was sort of like being a stairmaster for over 8 hours except the steps were often irregularly shaped rocks. As I thought might be the case, this was a more mentally challenging race than some of my past races. Holli wasn't there to back be up with encouraging words or to provide me with supplies. No one really had any idea what I was doing so there wasn't even the general ambiance of a race that can be so motivating. Still, there were some people who stepped up when I needed help. There was the fellow long distance hiker who helped me get back on track after I got lost trying to avoid the military base in the way of getting to Gubeikou (I never made it to Gubeikou, but made up for it by going an hour past Simatai). There was the two shop-keepers who generously gave me a pair of headphones after mine were lost in the same overgrown brush disaster that scratched up my legs and arms and led to, perhaps, the lowest part of the race. There was the woman who sold souvenirs on the wall who showed me a shortcut around a particularly bad hill during my final miles on the wall (dude, she said she comes to the wall everyday and then walks for two hours to get home. She told me that I was running fast and I believed her until I saw her move on some mountain trails--she was like a mountain goat! To make myself feel better I am telling myself that I wouldn't have struggled to keep up if my legs were fresh.) Oh yeah, and there was the American couple who gave me some sun screen--a critical supply that I failed to bring. In 2010, I will return to this section of the Great Wall with my students. I'm working with a travel agent who will arrange for overnight stays on the wall. I had my low points on the run and my high points--I perhaps had more doubts during this race than during any of my previous races. However, the scenery was incredible and getting to the next tower for another view was always a motivator--be sure to check out the video for some scenery and details about my run. Also, don't forget to click on the "Donate here" button on this site! Help support the fight against lupus! Since the Chinese government blocks Blogger, I've had to seek another location to blog during my trip. Please go to the following site for regular updates. Ah, with 48 hours until departure, I've now learned that blogger, the service hosting all my blogs, is being blocked by that wonderful organization, the government of the People's Republic of China. Stay tuned as I set up an alternate hosting site to use during my trip. 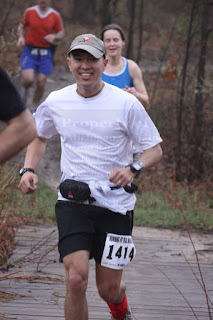 I woke up bright and early at 4:00 AM to head to Pinckney for the Trail Marathon on Sunday. I've actually found that it is not that difficult to roll out of bed and hop right in the car as long as I get everything ready the night before. Races are definitely more motivation to get up early than regular long runs. I was really looking forward to the event as I haven't been on trails much in the recent past and I felt that getting this long run in was important if I was going to be at least close to my training plan. I opted for the 7 AM early start, which meant that I was not allowed to finish in under 4:30 (not that it was likely that would be a problem). I was hoping to do an extra 9 miles after the marathon so I figured the earlier I started the better it would be. I met up with Dirt Dawg at the start and actually ran with him through the entire race. If you haven't checked out his blog and new podcast, I would definitely recommend that you follow those links. I first met Dirt Dawg when we were both training for our first 50 milers and have, in fact, not run together since we cruised the first part of the North Country Trail Run together in 2007. Dirt Dawg will be running his first 100 miler at Burning River this year also. Anyway, his company for the 26.2 miles was very much appreciated since headphones were not allowed at the race and anyone who knows me well realizes that leaving me alone to my thoughts is a recipe for disaster. Seriously though, the conversation helped the miles go quickly and, as we headed into the second loop, he put on some speed, which took us to a finish in just under 5 hours with negative splits on the second loop. Anyone who has run out in Pinkney knows that it is possibly the hilliest part of the Lower Peninsula and it definitely took a toll on me. On top of that, the weather was much warmer than expected and I didn't bring any electrolyte tablets. Consequently, I only added 8 miles at the end of the marathon and, to be honest, those were some pretty slow and ugly miles. In the future, I might try and add my additional training miles to the begining of the race instead of the end because it was sort of a drag to head back out on the trail while everyone else was relaxing after the race. Still, I put in just over 34 miles for the day and after a little air conditioning in the car and a trip through the Arby's drive through I was feeling much better. That's on top of a 12 mile run on Friday and I really can't complain about a 46 mile weekend. On a side note, the more I think about and start making plans for a 50 mile solo run of the Great Wall of China, the more excited I get. I might have to invest in some trail shoes though as the Trail Marathon left my feet a bit beat up from rocks and roots. I'll post more details about my Great Wall plan as they develop. P.S. The above photo of Dirt Dawg and I currently appears as the first of a set of photos on the front page of www.runmichigan.com so check it out. I'd like to welcome the latest member of Lupus Runners. We are truly a national group with previous runners from New York, Iowa, Ohio, Michigan, and now Texas! I've asked Cruz to write a short bio--he's planning a lot of races this year and getting set for his first marathon. My goal is to compete at the marathon distance, or higher. My basic training plan is to run each distance (5k, 10k, half marathon, marathon) at least three times before moving on to the next distance. Our second Lupus Runner is running his big race for the year tomorrow. 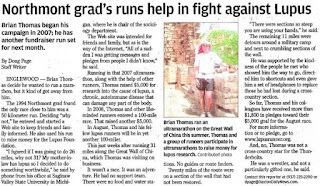 Tim will be running no less than the famous Boston Marathon! We are getting close to $1,000 in donations--let's see if we can take things into the triple digits for Tim! Have a great race and we look forward to report on how things go. 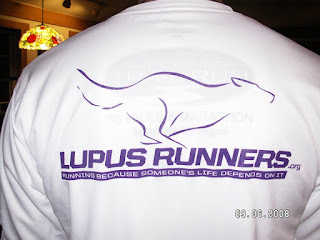 I'm also happy to announce that we have had another runner join Lupus Runners for 2009. Details soon! Training plans are, in my opinion, schedules that tell you what real life has deviated you from. 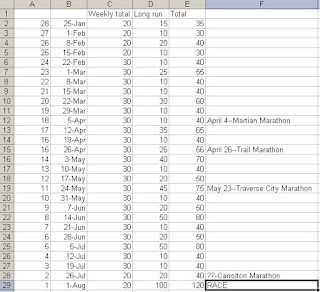 With summer coming close and the ultramarathon looming relatively near, I thought I would check the training plan I devised earlier this year and see how close I am. The bad news is that I am a little behind and that my weekly mileage has been below what I had hoped for. That being said, my long runs have been going well and I should still have time to get the runs that I feel I need for Burning River. Before Haliburton, I peaked with a late night 50 miler. If I can get a couple 50 milers in I should be in good shape. So why did I titled this post "First Brian the Sociologist International Ultramarathon?" Well, if I follow this training plan I will be attempting one of my long runs, specifically my first 50 mile run, while I am in Beijing doing a preparing for a 2010 study abroad trip. The logistics of this are a little daunting as I won't have my full set of running gear, resupplying with water and food may be problematic (dumpling stops? ), and many parts of Beijing are crowded enough so as not to be running friendly. I'm also not quite sure how I will fit it into my already busy itinerary. However, I think it is worth the effort as there are few better ways to see the city, if I can really get my act together I could do the whole thing on the Great Wall or someplace similarly cool, and with my GPS it is really pretty unlikely that I will get lost. 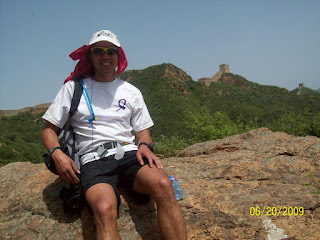 Anyway, I posted on the ultrarunning listserve that I will be in China, but didn't hear from any Chinese ultrarunners so if anyone out there reads this post and has suggested routes or just advice, post a comment! Have a great race, Deb! I just wanted to let everyone out there know that our first Lupus Runner is running a half marathon tomorrow. Deb is a lupus sufferer and has done a great job of raising awareness and funds. She deserves our support. I've posted a note below that Deb wrote on Facebook about her race. To see me today, you would not ever know that I was ill. Now is my turn to beat up on lupus. This is my revenge for the suffering and pain it has caused me. I will run the Illinois Half Marathon on Saturday, April 11, 2009. I'm asking for your financial support. During the race, I will wear a pace tattoo on my arm, marking where I should be along the course at what time. If you offer your financial support, I will write your name on my arm during the race, and you will act as my mental support during that section of the race. I will really need your support, as I am coming off of two weeks of illness, and am just 4 weeks out from the race. Does this count as speed work? Well, I completed the Martian Marathon with a chip time of 3:53. I'm really happy with that because I averaged 8:55 minute miles when I've been training at 10 minute miles. Also, this is approximately the same time that I had the last time I ran the Martian, which was 6 or 7 years ago (woah.) The race was fun, although it reminded me why I still prefer the culture of ultramarthons. Even though this was a relatively small marathon I still felt a little like I was part of a herd. Still, it was a nice way motivate me to put in a long run and it was fun to see all the people excited about the race (but really, do you need a hydration pack for a half marathon?) As always, Running Fit had everything very well organized, included some insane looking technical t-shirts and had some wonderful greasy pizza waiting at the end. I was planning on doing the whole thing in around 4:20 and adding on a 4 mile run in the end to make a nice round 30 mile day. However, at the halfway mark I overheard someone say that we were at a 4 hour pace and decided I would rather speed things up and get home early than stretch it out another few miles. I need to write a blog post one of these days about the honey/salt/molasses concoction that I have been using on my long runs. I switched between that and the Gu that they had at aid stations. Interestingly, I felt a tiny bit nausious around mile 15 after a few Gu packets, but felt perfectly normal after going back to the honey mix. Kept pretty even splits throughout so I'm feeling pretty close to on pace for the 100. Kudos to Deb who has kicked up the fundraising! I need to clear some grant reports off my plate and then hopefully will have the chance to start bringing in some money. Heading down for the Martian Marathon this weekend. I did this a few years ago and it was a nice run. I've more or less lost track of my training program; however, I did manage a 25 mile long run a couple weeks ago and a 20 mile long run the week before that so I'm feeling relatively solid. I might add a 4 mile run after the marathon for a nice even 30. My weekly runs have been really hit and miss. This week for instance I did 12 on Monday and 6 on Wednesday. It is unlikely that I'll have any time to run before the marathon on Sunday. Still, I was comfortable running 10 minute miles during my last 25 mile run so I think I'm making some progress. I'm not sure I could get away with such intermittant training if I hadn't gotten myself in shape for the 100 last year. I hear the endurance you build for ultras has more of lasting effect than for shorter distances--that might be just one of those web rumors though. In order to help encourage me to actually wake up in time for a brisk 6 AM run, I decided to submit my registration for the Burning River 100 mile run. $175, ouch. No refunds so I better get my rear out the door and do some running. So the running hasn't been bad, but it hasn't been consistent either. Two weeks ago, I ran a wopping 2 miles during the week. Then, feeling bad and noticing the sunny weather outside I did 17 miles on Friday. This was followed be a 20 miler on Sunday. This week I repeated my pattern of inconsistency and only ran once with a 12 miler on Wednesday. Hmmm... This probably isn't a pattern I should be repeating if I plan on finishing Burning River. So, my goal is to wake up early tomorrow and to get a 20 or 25 mile run in before noon. Perhaps posting it on my blog will help get me out of bed in the morning. I'd like to welcome Deb Frerick, a new Lupus Runner in 2009 and a lupus sufferer, has committed to run the Illinois Half Marathon on April 11th. Tim Smith has also joined us and will be cruising the Boston Marathon on April 20th. I wish them both the best of luck with their races and fundraising. I realized that 75% of the Lupus Runners from 2008 (everyone except for me) are scheduled to get married this year so I'm glad to see some new folks stepping up to help out. Okay, it's been a rocky winter for me in terms of training and that eternally difficult balance of what I need to do and what I want to do with my time. 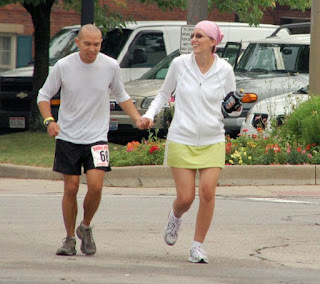 Thanks to an email from Debbie, our newest Lupus Runner, I've decided to kick things off for 2009. That means it is time for all of you to go to www.firstgiving.com/lupusrunners and to renew your commitment towards fighting a terrible disease. We raised $5,000 last year and I'm confident that we can do it again this year. While the money helps with research and education, one of the most important things that we did in 2008 was raise awareness. Debbie, who is a lupus sufferer herself, decided to join us after she saw Mae wearing a Lupus Runner shirt in a race. So, in addition to running my race (Burning River) and continuing to raise money, I'll provide a free technical t-shirt with the Lupus Runner logo to anyone who commits to running a race as a Lupus Runner and raises at least $200. If you want to be a Lupus Runner, just send me an email at brianjasenthomas@gmail.com. Happy running in 2009! Okay, so the last month was a "recovery" month, albeit an unintentional one. I've been feeling a bit adrift and unmotivated without a goal for this year so I've decided to go ahead and pick one. So the official plan for 2009 is to run the Burning River 100 miler on August 1. It's held in Northeast Ohio and takes place before classes start so the logistics should be easier to manage than Haliburton last year. The heat factor is a bit of a concern as is the fact that I'm planning on being in China and Tibet for a couple weeks in June, but it would not be fun if it was easy. 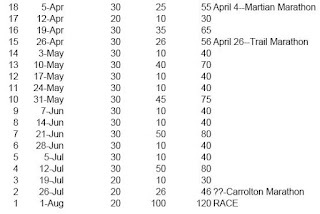 You can check out my training schedule below as well as a few area races I would like to complete along the way. Much to my shock, I am already ahead of schedule this week. I did 9 miles on Monday, 6 miles on Wednesday, and 10 miles today. I had a great run today since it was the first time that Elliott and I busted out the jogging stroller in months. 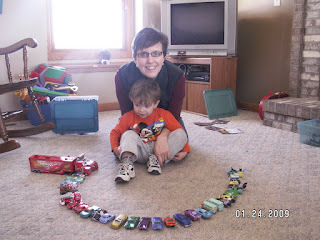 I recently bought a small portable speaker for my mp3 player so Elliott and I both spent the run listening (at least while he was awake) to the Cars movie soundtrack. I often wonder what the fine residents of Freeland think of us. For those of you who follow my Facebook status updates, my concern that his lack of napping at home will lead to the demise of my ultrarunning career was unfounded. He won't nap at home, but the jogging stroller had him sleeping after 10 minutes. On top of that, when he woke up after mile 8 he insisted that we keep running. I only quit after 10 miles because I hadn't anticipated a very long run and had neither water nor energy gels (I also don't want to risk injury by ramping up too quickly after time off). The little guy was upset that the run was over! I mean he was crying tears disappointed! Now if that isn't motivation to up the mileage I don't know what is. Well, it's already 17 days into the new year and I've managed to go out for a wopping one run. The refrain is a familiar one, work and weather have stood in my way. While I don't particularly mind running in weather that is in the twenties or even teens, jogging strollers don't do well in snow and my running schedule until now has hinged critically on multi-tasking (i.e. childcare and running). That and a series of 12 hour work days has left me little extra time. My one run, however, was quite a lot of fun as I've decided to embrace Michigan weather and my semi-rural residence by buying a pair of snowshoes for my birthday. 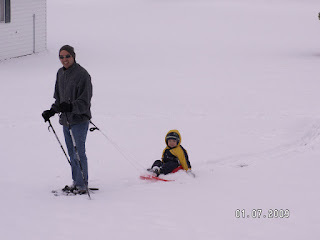 Above is a picture of Elliott and I trying the snowshoes. I tried out pulling Elliott on a sled, which was fun for a while, but I couldn't get up to speed without kicking snow in his face (he had fun being pulled around our yard though!). Later I went out for a hour long run through some fields with the snowshoes by myself. I highly recommend the workout as it is relatively easy to run in them and it is fun to offroad through farm fields and areas that I wouldn't typically run. It is a bit like running in sand so you can expect slower speeds and a bit more of a workout, but it does have me looking forward to more snow. We are expecting about 8 inches by Sunday so that's a good thing. On a side note, I did end 2008 on a high note with one final informal marathon to wrap up the year. I also racked up 2,599 miles over 2008. It's probably a bit more then that since I have been pretty irregular about recording my runs since my GPS began flaking out. Anyway, happy new year to all. I hope to have some time to think about my goals and plans, as well as those for the Lupus Runners, in the near future so stay tuned!